When it became clear that unopposed estrogens increased the risk of endometrial cancer in postmenopausal women, MPA and other synthetic progesterone analogs were added to suppress estrogen-induced endome­trial growth. At the time, oral progesterone was poorly absorbed and was not an option. It wasn’t until the latter part of the 20th century that micronization of progesterone into particles less than 10 microns in size led to increased surface area, enhanced dissolution, and improved intes­tinal absorption, making oral progesterone a viable hormone therapy. Over the years, numerous scientific papers have used the word “proges­terone” as a catchall term that included synthetic progesterone analogs as well as progesterone. This misrepresentation of progesterone created confusion for both researchers and clinicians, as it suggested synthetic progesterone analogs had the same effect on progesterone receptors as progesterone. There are clinical scenarios that strongly suggest otherwise. For example, MPA is considered a teratogen and is contraindicated in the first 4 months of pregnancy. In contrast, progesterone vaginal supposito­ries are often used in the first trimester to sustain pregnancy. Clearly, the 2 molecules have very different effects in childbearing women and could reasonably be expected to have other differences. Unfortunately, they were considered sufficiently equivalent for MPA to be widely recommended as hormone replacement in perimenopausal and postmenopausal women. Eventually, problems with MPA were exposed in these populations, partic­ularly in the areas of cardiovascular health and hormone-related cancers. To examine the cardiovascular effects of MPA, women on estrogen therapy combined with MPA were compared with those on combined estrogen and oral micronized progesterone (OMP). The Postmenopausal Estrogen/Progestin Interventions (PEPI) Trial found oral CEE significantly elevated levels of the inflammatory marker C-reactive protein regardless of whether CEE was unopposed, combined with MPA, or combined with OMP. However, CEE combined with MPA elevated CRP significantly more than CEE alone or in combination with OMP. The PEPI Trial also found that increases in high-density lipoprotein (HDL) levels from oral estrogen supplementation were preserved when OMP was used, but not when MPA was the progesterone analog of choice. MPA also interferes with the benefits of estrogens on coronary vaso­spasm and exercise-induced myocardial ischemia. In young women, acute MPA administration negates the beneficial endothelium-dependent vaso­dilatation effects of estradiol.16 In contrast, use of OMP maintains the cardio protective effects of estrogens. Although breast cell proliferation, and therefore potential for DNA damage, is increased in the luteal phase when progesterone levels are at their peak, evidence to date does not indicate that progesterone increases the risk of breast cancer. A French study of 1,150 women with fibrocystic breasts saw no increased breast cancer risk in women using topical progesterone. In fact, the study showed that breast cancer risk decreased significantly when topical progesterone was combined with oral progesterone (RR = 0.5 compared to nonusers). In addition, a French prospective study of more than 50,000 women found that the relative risk (RR) for breast cancer when estrogens were combined with MPA was 1.4, but the RR dropped to 0.9 when OMP was used instead of MPA. Another study found breast cancer patients with the highest endogenous progesterone levels at the time of surgery had significantly better survival at 18 years follow up. A Maturitas review of progesterone reported “progesterone is able to counteract the estrogen-induced proliferation of human mammary epithelial cells.” In contrast, postmenopausal women using MPA reported significantly greater cell proliferation and density than women treated with estrogen only or those receiving no treatment. In other words, proges­terone appears to reduce breast cancer cell proliferation while MPA fuels it. Neither synthetic progesterone analogs nor progesterone have demon­strable benefits on bone density. A 3-year study of progesterone cream 20 mg daily failed to show any benefit for progesterone versus placebo on markers of bone density.25 A 1999 study by Leonetti similarly found no benefit for progesterone cream on bone density after 1 year.26 However, the use of a long-acting injectable MPA contraceptive in young women decreased lumbar bone significantly after 2 years. This preliminary data suggests that while progesterone has no benefit on bone density, MPA may in fact have a negative effect. Menstrual irregularity? Difficulty sleeping? Irritability? Is it menopause? 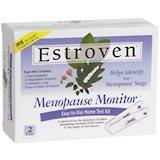 Now you can take the mystery out of menopause with the Estroven Menopause Monitor.